Last night, at midnight, border controls were lifted as nine countries entered into the Schengen aggreement and into Europe’s border-free passport-free zone. The Czech Republic, Estonia, Hungary, Latvia, Lithuania, Malta, Poland, Slovakia, and Slovenia joined the zone. In a way, this was a final step for many people in the lowering of the iron curtain and the barrier between Eastern and Western Europe. A big day with big celebrations along so many border towns and cities. The town of Sátoraljaújhely (literally “Tent Button New Place”) is on the border of Hungary and Slovakia and was split into two when borders were redrawn by the Trianon treaty in 1920. As of midnight, residents can simply walk across and visit their neighbors without going through border guards and passport controls. However, there is another town on the Slovak Ukrainian border called Velké Slemence which is still split. For decades the two halves of this town had no access to each other. But at the strong appeal of the American Association of Hungarians, the governments set up a border passport control station so that friends and family members could once again visit one another. 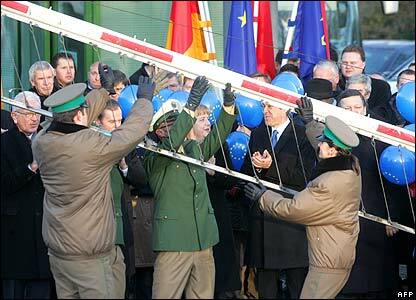 As a result of the expansion of the Schengen countries, this border will become much much tighter along with those on the Eastern and Southern edges of Hungary. Thanks for this Mark. Here in the States we take so many things like this for granted. It is good to get some perspective on what is happening in other parts of the world. Frankly, I find it embarrassing when I realize just how unaware I am of what happens on either side of the oceans around North America.